JohnBean wheel service equipment, the innovators of 3D alignment and balancing technology - has an amazing offer for armchair racing fans. 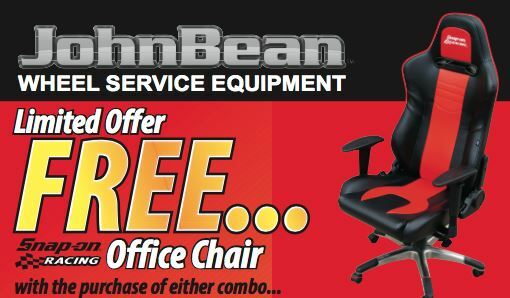 When you purchase one of the following JohnBean wheel service combo's, you receive a very cool Snap-on Racing office chair, for nada! If you buy a Pro42 3D Wheel Aligner in combination with either any wheel balancer or any tyre changer unit from the range, you automatically qualify for this fantastic deal - but only in April! Don't delay - speak to your authorised dealer or visit www.johnbean.co.za .